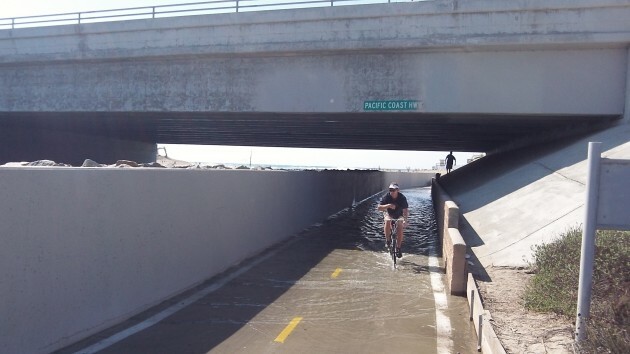 The tide has temporarily flooded the bike path under the Pacific Coast Highway. In Benton County we’re at least several years away from completing the Albany-Corvallis Bike Trail, so in order to visualize the thing we have to ride other paths, such as SART, the Santa Ana River Trail in California’s Orange County. Unlike SART, the Albany-Corvallis path won’t have a handy acronym. ATCT is hard to pronounce. And if the cities are named in reverse order, CTAT is no better. It also probably won’t have subtropical conditions in October, but it will still be a major advance in terms of safe human-powered transportation, and the scenery will be more pastoral than that of SART, which is a long and elaborate bike trail system connecting the Pacific Coast Highway with cities miles from the beach. Crossing the river is easy on this bike-pedestrian span. And in case you get lost, there is helpful signage. Its nice that California takes such good care of their bike trails – meanwhile their highways are abysmal and the state is broke. Highways down there are in terrible condition but they would rather spend billions on a high-speed rail system that goes from nowhere to someplace no-one wants to go. That’s Progressive for you. As far as a name for the would-be bike path, how about “Albany Corvallis Trail” (ACT). Doesn’t seem too difficult to remember and has a nice connotation; of course Corvallis would object because it has to use Corvallis first in the name. Probably propose something like The Corvallis Human Powered Transportation Arterial to Save the Planet and Make People Healthier While Doing Something We Know Is Good for You Path. Last winter I drove the entire length of California twice. The coast highway was a miserable pot-holed asphalty trail from the Oregon border almost to San Francisco . I drove I-5 on the section you mentioned last year and is indeed greatly improved over the last several years when it was terrible. I also drove Hwy 99 all the way from Sacramento to Bakersfield and then Hwy 14/138 across the mountains which was nearly as bad. The freeways were acceptable for the most part but secondary highways were disgusting. I grew up in the SoCal desert and drove the length of the state many times. The roads have deteriorated badly over the years while the volume of traffic has increased many times. The worsening road conditions were verified to me by a close friend who is a retired CHP officer who worked up and down the whole state. And finally LA and The City may be the dreamy-eyed final destinations of the high speed rail but are totally unrealistic due to cost and legal obstructions and will never be built. The current destinations are Bakersfield to Merced. Not at all. They just left a whole lot of their debt (like public pensions) off the books. Its easy to balance a budget when you just don’t include your whole debt. Other sources than the lefties at NYT can give you a better idea of CA’s budgetary fraud. I hate to burst your bubble Hasso but I was riding those CA “bike trails” when I was about 8 years old. They’ve prettied em up a little since then and some of them have been re-routed to go under the bridges better but my family used to ride them all the time more than 50 years ago. On some of them, when the water is real low, there’s a slimy film of moss or algae on the bottom cement. It makes for some scary riding because it’s so slippery. Originally the “trails” were used as access roads for maintenance trucks on the river beds. It was common to see these trucks riding along the top ridge of the river bed with angled access roads to go underneath the bridges. These riverbeds serve a vital function throughout the LA/Orange county basins. Without them, during the winter, the rains would cause flash floods wiping out whole communities. “A recreational bikeway and trail from the San Bernardino Mountains to the Pacific Ocean was first envisioned over 100 years ago. In 1955, the idea of a Santa Ana River Trail and Parkway was formalized. Since that time sections of the 110 mile trail have been completed and the trail currently serves the needs of recreational bicyclists, equestrians and even provides an opportunity to use alternative means of transportation for some commuters. 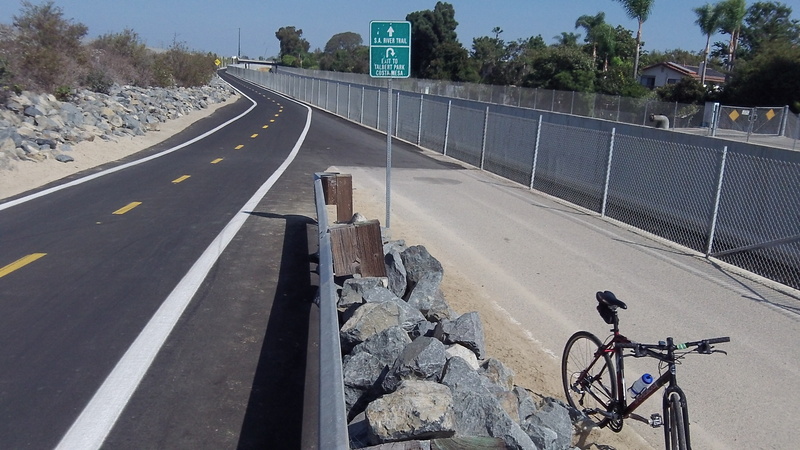 “In a survey of recreational trail users, the Santa Ana Watershed Project Authority (SAWPA) found that completion of the backbone of the Santa Ana River Trail and Parkway was their highest priority.